Backpacking on a budget in Punta Cana area now is possible as part of your Dominican Republic travels. Macao Beach Hostel is a unique space where you and travelers from all around the world have the amazing experience of getting immersed into the Dominican culture, going back to the basics and merging with the Caribbean nature while having time and space for relaxing and/or exploring your artistic side. Hosts and staff are frequently involved with cultural and artistic activities in which you will be welcome to participate if desired. Our blue house and campsite are located 12 minutes walking from Macao Beach, 35 minutes by car from the airport, 25 minutes away from the touristic spots of Bávaro and Punta Cana and 30 minutes from Higuey. Off the beaten track and away from the resorts and packaged holidays, Macao offers a delightful experience to the adventurous, curious and open minded travellers. 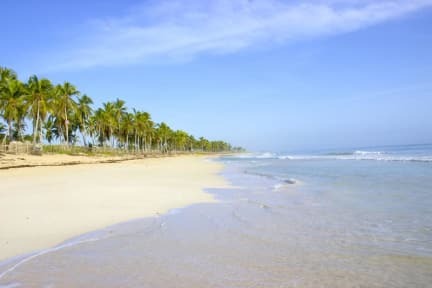 The sights and sounds of the real Dominican Republic fuse fabulously against a backdrop of pristine beach and a gorgeously green, luscious landscape. It is impossible not to fall in love with this place. Helpful and friendly locals, the residents and shopkeepers will be waving and greeting you for your entire stay. The restaurants in Macao vary from beachside bars offering cold cervezas and freshly caught seafood to comedors (local restaurants) where typical Dominican cuisine is on offer. Be sure to try the mangu and tostones! For a fun way to start your day, head to one of the colmados for a coffee, its like a 7/11 but with louder music and a Caribbean vibe that will make you smile. For authentic Dominican nightlife the closest town nearby has a few nightclubs open late. Nearby resort town about 25 minutes away by car which has all the familiar stores and services of western style living such as grocery stores, pizzerias, cafes and nightlife entertainment franchises. The house includes 2 private bedroom with a full size bed, 2 private bedrooms with 2 beds, a shared bedroom with 5 beds as well as a unique camping zone in the middle of papaya and banana groves. Our living room is furnished with a shared desk, small coffee table and comfortable rocking chairs to enjoy. We have an open air outdoor kitchen with an awesome papaya tree, internal and external bathrooms as well as a beautiful huge back/front yard. Across the road is a cow field with mango trees and behind the house is a papaya and plantain grove. Wifi access available although it should be noted that due to our location there are scheduled rolling brown outs that cut the network for a few hours a day. The property has 2 very friendly and playful dogs that are cared for by the family which owns the land. Feel free to pet them or feed them, as long as it’s not chocolate! An ideal space for relaxation, creativity and developing your artistic craft whether it be writing, music, dance or anything else of that nature. Your hosts are two musicians, producers and dancers who are active in the local concert scene of the nearby resort town, so if you are curious about attending some live events or experiencing the nightlife in general, you will have safe and reliable guides to maximise your experience! Also worth mentioning is direct access to horseback riding, surfing and adventure buggy excursions as our house is located on the touring trail. Full access to kitchen, living room and bathroom at all times. Front and Backyard fully accessible with papaya trees that you are permitted to pick from. Parking is available for any size vehicle. Guests should bring their own towels. Laundry service can be requested for a fee of 5 dollars for one large machine washed load, otherwise it can be done by hand in a wash basin. Music is encouraged however to respect the locals we must lower the volume after 11pm. We host a very open and friendly environment for those who choose to interact with us in our daily routine. We are very welcoming and inclusive in our activities and are more than happy to guide, consult and direct in any way we can. Preparing and sharing meals, company for trips to the beach, or a tour of the local restaurants and shops are all possible. If privacy and solitude is desired we can accommodate respectfully. If transport is needed for shopping or sightseeing purposes there is a motorcycle which can be driven by us to take you. Happy children and peaceful tame dogs run all throughout the front and backyard in the afternoons while chickens roam freely around the property. You may find yourself in front of a few curious children staring at you in their school uniforms amidst a variety of wagging tails and panting tongues. Feel free to bring your instruments or painting supplies or any other creative materials as our household is an artistic environment which encourages these activities! Laundry service can be requested for a fee of 5 dollars for one large machine washed load. Pick-ups, transfer services, tours and local meals are also provided on request. As we try to keep the real Dominican countryside lifestyle, there are some facilities like air-conditioning, hot water, cable tv, microwave, that we don't use, this help us to maintain our property rustic and traditional. Most of you may need is within walking distance. Also, there is a bus that you can take on the corner and it goes to the nearest major city, in which you can transfer to buses that travel on the major routes throughout the country. Just be prepared when walking for lots of hand waving and shouting ¡hola! Also, if you prefer an easier way and lower rates than a taxi to move from one place to another, we can help you with the arrangements of your transfers. * Bring enough cash for your stay because there are not ATMs around. You can use either USD or DOP. * We can take you to the best places for exchange your money if needed, that way you'll get better exchange rates.